Man’s will to meaning is his desire to live a meaningful life. A frustrated will to meaning can lead to psychological problems that require the attention of a therapist. The timeline below shows where the term Will to meaning appears in Man’s Search for Meaning. The colored dots and icons indicate which themes are associated with that appearance. Walker, Lanier. 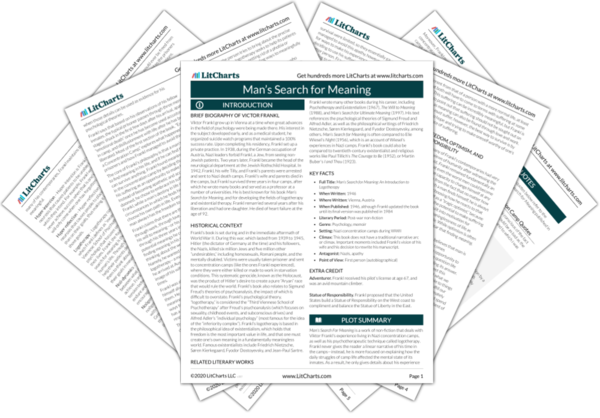 "Man’s Search for Meaning Term: Will to meaning." LitCharts. LitCharts LLC, 18 Jun 2017. Web. 18 Apr 2019. Walker, Lanier. "Man’s Search for Meaning Term: Will to meaning." LitCharts LLC, June 18, 2017. Retrieved April 18, 2019. https://www.litcharts.com/lit/man-s-search-for-meaning/terms/will-to-meaning.